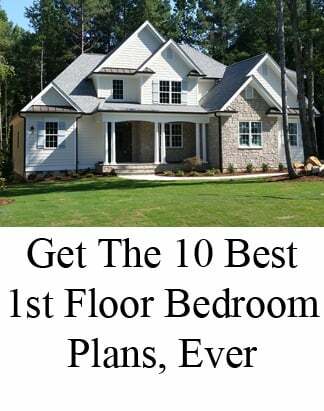 Home buyers in North Carolina, and through the United States, are spending more money in their kitchen design and features than any other room of the home. And kitchens are serving more functions than ever - as places to eat, entertain, and interact. Take a look at some of our favorite kitchens with maple cabinets, below. All of the kitchens pictured in this article feature maple cabinets - in several different styles and finishes. 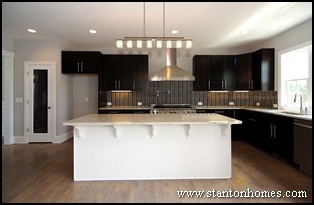 Your kitchen design options are endless when you build a custom home with Stanton Homes. 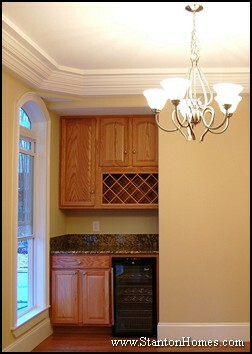 And maple kitchen cabinets can come in a wide variety of colors, styles, and finishes. 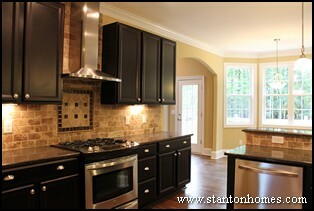 Here are just a few of our favorite Chapel Hill, NC area custom home kitchens with maple cabinets - created by Stanton Homes. In this first custom kitchen design, the Maple kitchen cabinets are painted "linen white" to achieve a country farmhouse style. 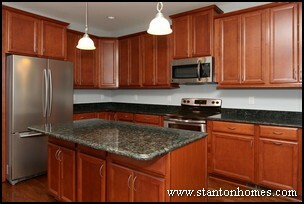 These maple cabinets have a raised wood center pannel with a square profile. 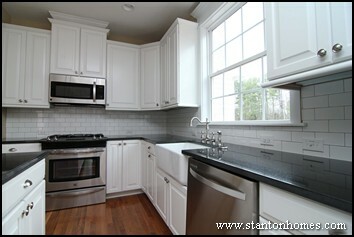 The large white subway tiles in the backsplash paired with black granite counter tops create a beautiful contrast. In this second custom kitchen design, the Maple kitchen cabinets come in an Espresso finish to achieve a contemporary, modern style kitchen. 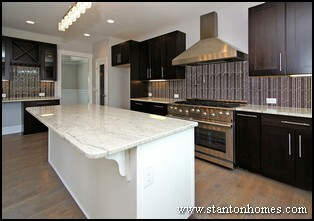 The oversized island contains a secondary prep sink - for those who love to cook. 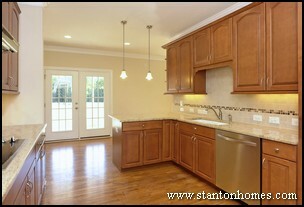 A lighter hardwood flooring finish helps open up this kitchen. In this thrid custom kitchen design (two different kitchens are pictured), the Maple kitchen cabinets come in a Cognac finish for a bright, open kitchen style. 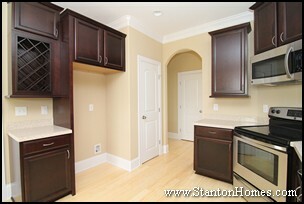 These maple cabinets have classic arch style doors. The door pannels in this kitchen are recessed, with a triple carved edge along the rails and stiles. 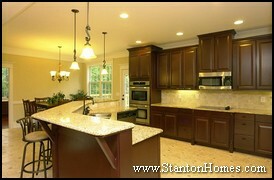 See more custom home kitchen design photos on Pinterest. In North Carolina new homes, the pairing of dark espresso cabinets and light cream-toned backsplashs and granite countertops is becoming a huge kitchen design trend. See these kitchen trends for yourself, in recently completed Chapel Hill, Raleigh, and Durham custom homes by Stanton Homes. Why do we love this dark-against-light kitchen design? Black and white kitchens have stood the test of time. And dark espresso with cream-and-grey infused whites are a modern take on this lasting trend. The kitchen pictured to the right is located immediately off the foyer - designed to draw your eye as you enter the home with an immediate wow factor for your guests. The kitchen pictured to the left is tucked between the great room and formal dining, out of view from the foyer. But the effect is just as dramatic: a huge bright white island with bar seating contrasts sharply with dark cabinets and dark tile back splash. 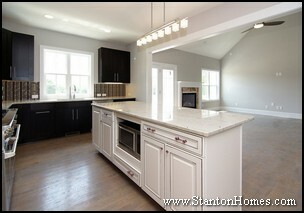 The stainless steal gas range, pot filler, and large sink make this kitchen perfect for those who love to cook. 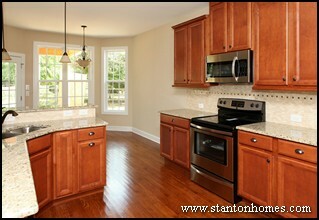 The kitchen pictured to the right is located off the great room and breakfast nook - designed for stylish efficiency. Cabinet storage and countertop square footage are maximized in this kitchen floor plan design. The speckled cream countertops have an easy contrast against the cabinets - creating a smooth integration of lights and darks. 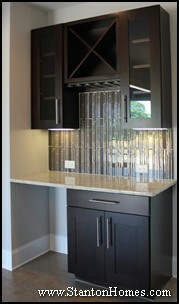 The contrasting custom tile backsplash with diamond insets brings the entire kitchen together. While we see a trend towards contemporary style kitchens with a heavy contrast between features, we can't ignore other popular designs that focus on the use of tans and browns - with maple and oak cabinetry. 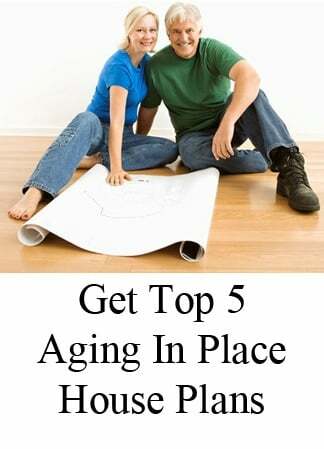 Watch for more trends and tips! Where should I place a wine rack in my kitchen? Built-in wine racks can be designed as a bold centerpiece of the kitchen, or as a descrete storage area. The NC custom home pictured to the left, the Worthington, includes an espresso wine storage cabinet with stem glass holders built-in below and open glass cabinet doors on either side. Keep in mind: both light and excessive heat can damage a bottle of wine. So, if you are planning to store wine in a rack or open cabinet (versus a climate controlled refrigerator or basement/cellar storage area), try to place the built-in rack on a wall receiving as little natural light (and heat) exposure as possible. My kitchen is already packed with cabinets and appliances. Where else can a wine rack be integrated into my new home? 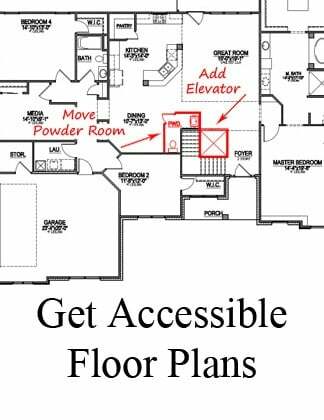 If you already love your kitchen floor plan, another favorite location for a built-in wine rack and/or refrigerator is a butler's pantry. A butler's pantry can be located in the dining room, a hallway, an alcove underneath a staricase, or a transition area between a kitchen and dining room. The NC custom home pictured to the right, the Kessler, features an optional dining room butler's pantry with built-in wine rack and wine cooler. Why are racks designed to store wine sideways? Wine racks are designed to store bottles sideways to ensure the wine stays in contact with the cork. A moist cork maintains a tight seal, keeping wine fresh. A dried out cork can shrink, allowing oxygen to spoil and age the wine. The NC custom home pictured to the left, the Almodovar, freatures a Tahoe Cherry Java built-in wine rack with liquor cabinet above. 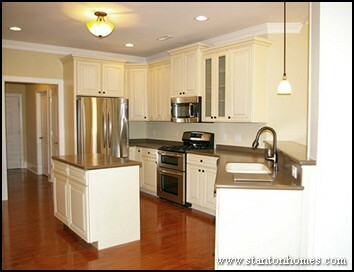 A kitchen island can be an integral part of your new home kitchen design -as the center for activity in your new home. Islands can be accessed from all sides, which makes them ideal for workspaces, storage, and bar seating. Kitchen islands can be a beautiful feature in custom homes, even on a budget. The style, size, and design depend on both taste and budget. Looking to keep your kitchen costs down? Consider an island with one bank of full cabinets, with a great seating area. The custom home kitchen island pictured to the right - the Kimberly - features cabinet storage and plenty of granite countertop space for comfortable bar seating. Add some pendant lighting to emphasize this focal point of the kitchen. In some kitchens, the island can provide the majority of the counter space. 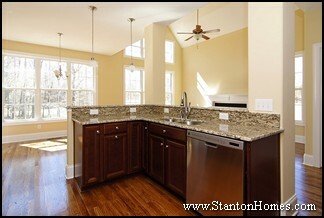 Guests and family can be seated around the kitchen island while meals are prepared. The custom home kitchen island pictured to the left - the Worthington - features a contrasting white cabinetry selection with lavender hardware, to compliment the expresso kitchen cabinets. Homework routines can even revolve around the kitchen island - it's easy to answer those math questions while chopping vegetables! 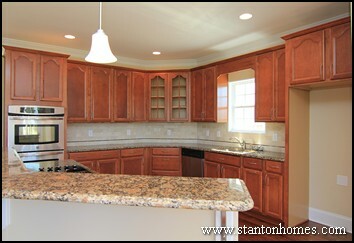 A kitchen islands can feature a microwave, cooktop range, sink, drawers, shelves, spice racks, cabinetry and more. 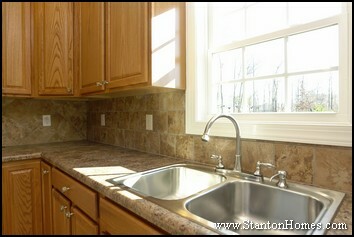 Thinking of moving the kitchen sink to your kitchen island? - Is there enough room for the dishwasher next to the sink (both depth and width)? - Can the dishwasher open comfortably, with room to walk around? - Is there room to include a pull out garbage bin/recycle center? - Can the silverware be stored near the dishwasher? - Is it possible to use dual height counters to better hide those dirty dishes? 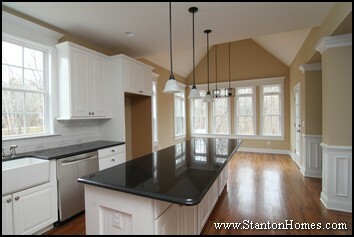 Want to use the kitchen island mainly for food prep? - Are there outlets for small appliances? - Is the refrigerator and cooktop conveniently close? - Do you want a prep sink? - Should you consider a butcher block counter? 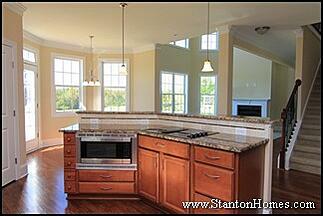 Looking to cook at the kitchen island? 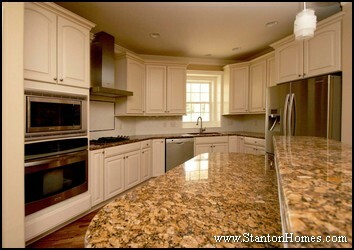 - Countertop materials: should it be heat resistant for ease of cooking? - Is there at least 18 inches of counterspace on either side of the range or cooktop? 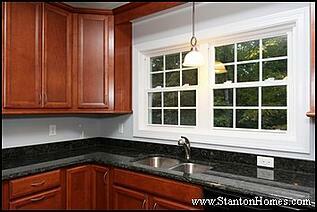 - Can an overdraft hood be added, or is a downdraft cooktop required? What is the additional cost versus a typical range or cooktop? - Should a raised eating area be included? The custom home kitchen island pictured to the above - the Kelley - features a convection cooktop (downdraft cooktop), granite countertop, raised bar with tile backsplash, microwave underneath, cabinets, and spice drawers. Will you dine frequently at the kitchen island? Discuss your options for informal dining at the kitchen island. - How many can you seat comfortably at the island? - Should stools be tucked away when not in use? - How much will seating limit your storage options? - What height should the island be? Do you want two heights? Your new kitchen island design should reflect your taste, be fully functional, and be ready for multiple uses and plenty of storage. 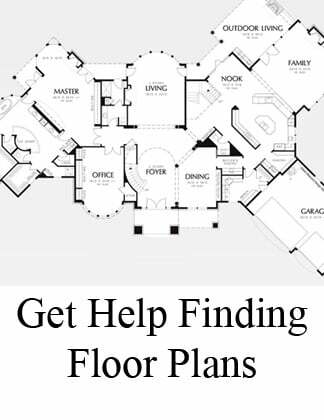 Talk to your builder about your ideas for your kitchen island design - and which features are most important to you. Islands can include: raised bar seating, appliances (sink, cooktop, dishwasher, microwave) storage (cabients, drawers, open shelves), spice drawers, "peninsula cabinets" (open on both sides, with two sets of doors), roll-out recycle bins, and more. Bring pictures of what you have in mind. 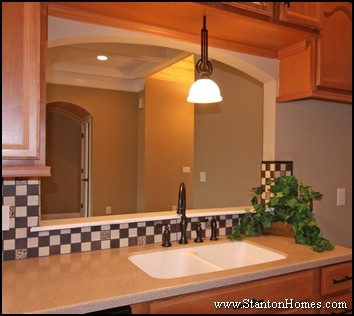 Stanton Homes will help you decide what's right for you, based on budget, size of kitchen, traffic flow, features, and other design considerations. 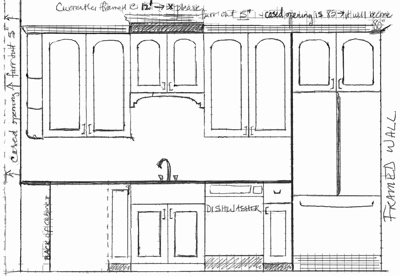 Kitchen Floor Plan Layout - Island or Peninsula Design? 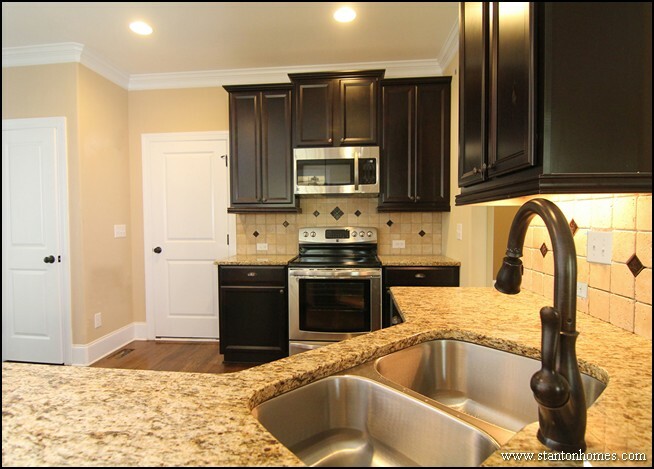 As you make plans for the Durham, NC custom home you’d like to build, it’s always fun to choose your favorite kitchen features. The kitchen is one of the most used rooms of the home, and you will use your sink every day. 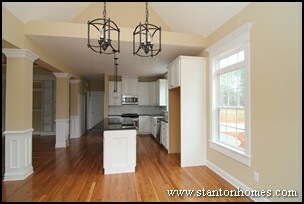 Take a look at these recently completed custom homes in the Durham, NC area for 2012 kitchen sink and faucet style ideas. Stainless steel sinks are one of the most popular choices for custom home kitchens. Stainless steel sinks are easy to clean and durable. A lower-gauge stainless steel makes a higher the quality kitchen sink. The NC custom home pictured to the left has a single-bowl stainless steel under mount sink with single lever pull-out spray faucet and matching built-in soap dispenser. The NC custom home pictured to the right has a double-bowl white cast iron under mount sink with single lever faucet and spray arm, fitted to granite countertops. The NC custom home pictured to the left has a double-bowl composite under mount sink with double-lever faucet and matching spray arm. 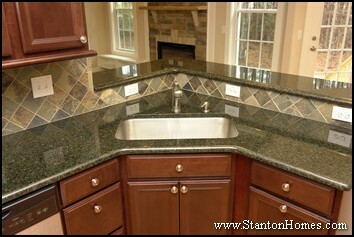 A kitchen sink can be an under mount sink (placed under the counter) or a rimmed sink (placed on top of the counter. Under mount sinks are more popular because they have no rim or e dge to catch water, dirt, and food particles. But, under mount sinks require a solid countertop made of materials like corian, granite, cement, or stainless steel. 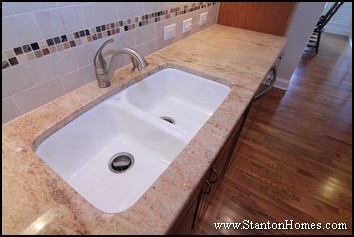 Rimmed sinks (pictured to the right) are mounted above the countertop, with a smooth integration. Rimmed sinks are not limited to solid countertop materials, and are usually placed in formica countertops. Custom home kitchen sinks usually come with one or two bowls, although some kitchens use three bowl sinks (which are handy when there are multiple cooks needing to share the same sink space). Single-bowl sinks can accommodate large objects like pots and pans. Double-bowl sinks are more common in Durham new homes. They are convenient for prep work and can accommodate a range of objects of various sizes. Typically double-bowls come in a 60-40 size ratio. Two of the most popular custom home sink faucet special features are the spray arm and the pot filler. A spray arm is an additional attachment that can be installed next to the sink faucet, or it can extend out of the faucet. The sprayer helps wash larger objects or reach out to fill containers. A pot filler - used to fill large pots - is installed above the kitchen range. The faucet arm folds against the wall, and can extend out to reach over a pot on the stove. The Worthington (pictured above) is a great example of a gourmet kitchen designed for frequent cooking - with the convenience of a pot filler. 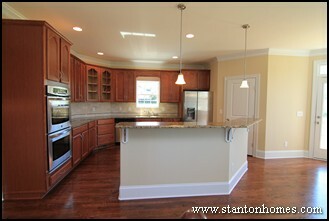 When you build an NC custom home with Stanton Homes, making changes to your kitchen floor plan is easy. 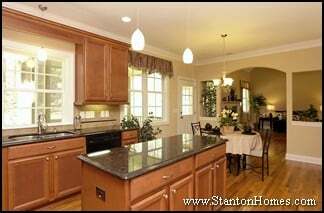 And with Stanton Homes free initial design services, you can see all the possibilities for your new home kitchen, before you make any decisions. Is Oil Rubbed Bronze the Next Big Thing to Hit Kitchens? 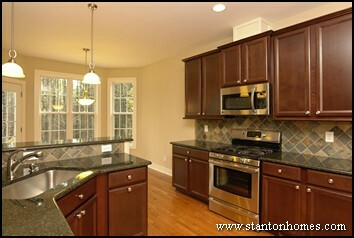 What are some top design trends for Chapel Hill new home kitchens? One top trend is adding designer appeal to the kitchen without spending a lot of money - with a tile backsplash. Take a look at these Chapel Hill, NC custom home kitchens with white subway tile backsplashes, and get ideas for your new home. 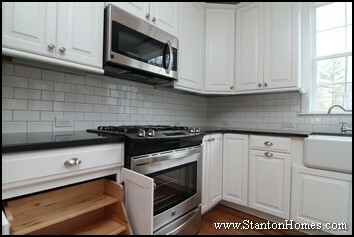 A classic 3 x 6 glazed white subway tile, along with white colored cabinetry, has withstood the test of time. White subway tile backsplashes have the ability to transcend style - from cottage charm to traditional elegance to modern simplicity. The Chapel Hill new home pictured to the left has a "Farmhouse" style custom kitchen with white subway tile backsplash. Any time a brick pattern is used in a back splash area it visually expands the space. If your favorite Chapel Hill new home floor plan has a smaller or alley style kitchen, a white brick tile backsplash may be the perfect compliment. The Chapel Hill new home pictured to the left is a kitchen in a single story floor plan, the Bethesda. 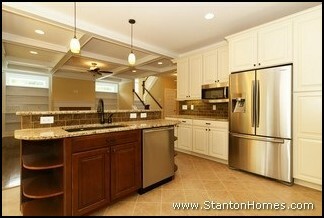 The Bethesda kitchen is an alley style, open to the dining and great room. The Chapel Hill new home pictured to the left features white cabinetry paired with white subway tile, for a trendy yet tasteful combination. 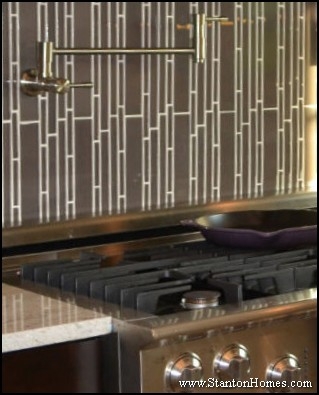 A custom-designed pencil listello tile inlay sits above the gas range. 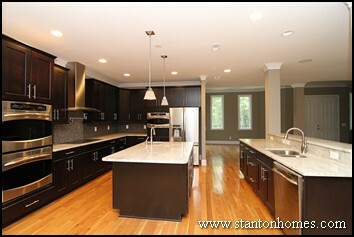 Granite countertops, stainless steel appliances, and subtle touches of black help define this kitchen. 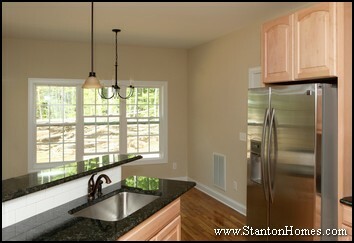 Click here to see more photos of this new home kitchen. 3x6 white subway tile backsplashes can help spotlight intricate cabinetry, with a simple look that only feels more expensive - this type of tile is readily available and inexpensively priced.